My First Kimono | Ready, Set, Kimono! 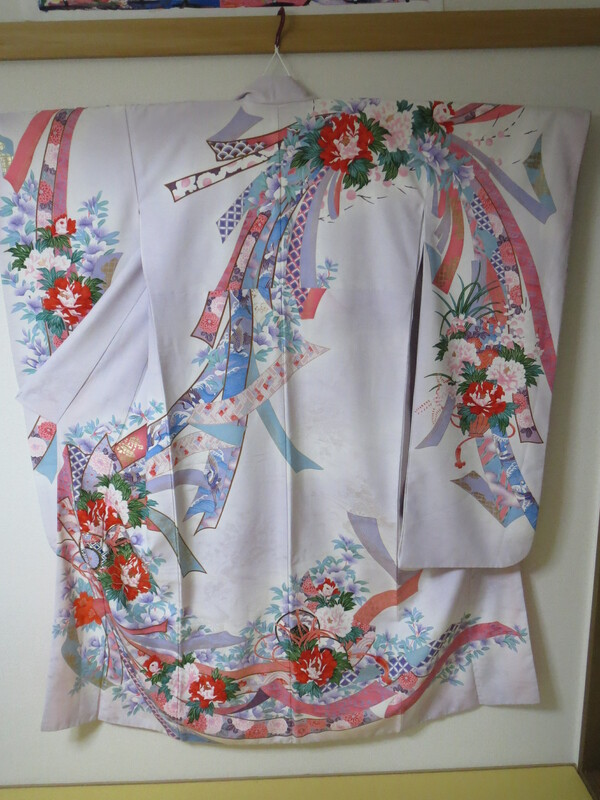 I got my first kimono in Kyoto during a trip in 2006. Here it is. Then, I wanted to get an obi to go with it. Again, not knowing anything about kimono, I asked the shopkeeper what she would recommend. She brought out a pink hanhaba obi. She told me it would be easier for me, as a foreigner, to tie it. At the time, I accepted it. Now, I cringe at the thought. After living in Japan for several years and studying kimono for two, I know what a faux-pas that is. I also didn’t get any undergarments. No nagajuban, no datejime, no koshihimo. Just a karihimo that the shopkeeper threw in. I thought I was set and ready to wear my kimono. But I also realized that I needed footwear. I spotted a pair of geta at the local market (again, I knew nothing) that had straps that matched the pink in the kimono. I got them, but I’m proud to say that I never wore them. Not because I learned better, but because I realized that they were too small for me. So to summarize, my first ever kimono outfit consisted of one furisode, one karihimo, one hanhaba obi, and one pair of geta. Sigh. Everyone starts somewhere. This is where I started. I’m going to go hide in a hole now and burn any pictures I have of me wearing that embarrassing combination. Maybe you can share and still use those photos when you complete your ensemble the way you want it to me. Maybe you could post a series of do/don’t guidelines. Put me in the category of still learning too. I think that the kimono you have above is very nice. Thanks. I’ll keep that idea in mind.